If you read PlanetKDE, you may have noticed that there was a combined Booth, Web and Marketing Sprint in Stuttgart last weekend. While those blog posts discussed the fun to be had in getting a load of KDE contributors together in one place, the event was really about having some important discussions and getting a lot of serious work done so that our presentation of KDE matches the quality of our products. Read on for details of the many things we got up to. In these testing economic times, KDE was pleased to bring Dollars, Pounds and non-German Euros to Stuttgart, the home of Porsche. Unfortunately early reports indicate that there was no rise in Porsche sales arising from the event. We were simply too busy to think about cars, getting straight to work at 9am on Friday morning and working through the weekend. We were laying the foundations for a professional KDE booth presence at exhibitions, a coherent marketing strategy around the 4.4 release of the KDE Software Compilation and an easy to use and attractive website presenting the KDE community and its products. We had attendees from Europe and North America representing the Promo, Web and Booth teams as well as several people with a foot in more than one of the teams and other parts of the KDE community. We mixed new contributors bringing enthusiasm to their first KDE event and seasoned KDE folk able to provide wisdom and experience. 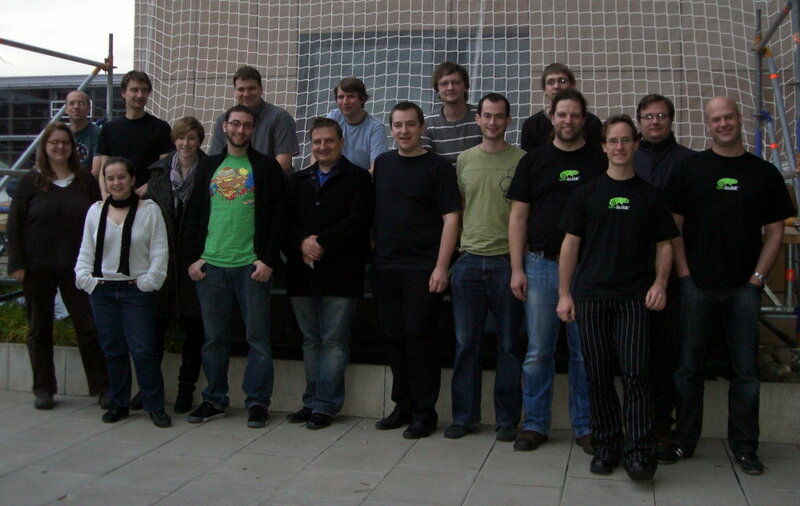 From left to right in the photo: (top row) Kenny, Troy, Rainer, Jos, Ingo, Daniel; (front row) Valerie, Lydia, Claudia, Justin, Martin, Eckhart, Stuart, Cornelius, Frederik, Luca, Frank. One major focus of the meeting was to come to an agreement on a rebranding strategy for KDE. For some time we have been trying to refer to KDE as the community, rather than the products we create, but this has been made difficult by lacking a name for the products. Prevent the misconception that KDE applications are tied to the KDE desktop and vice versa by introducing a new brand for the desktop. Phase out the term "K Desktop Environment"
Full details of the conclusions we reached will be announced shortly in a separate Dot article. The goal is to implement the new brands by the release of the KDE Software Compilation 4.4. Related to the rebranding efforts, we discussed how application authors can identify their applications as KDE applications (without moving back towards the gratuitous use of the letter K). This is particularly but not exclusively targeted at third party developers who may not see themselves as part of the KDE community as a whole but want acknowledge their links with KDE technology. We would like to provide a label authors can use to say that their application is using KDE technology, they feel part of the KDE community, or both. This label could be used on web pages, in the about dialog of the application, or generally in communication about the application. We will gather feedback from application authors by doing a poll on kde-apps.org on these five options. Then we can decide about which one(s) to use and create some graphics, banners, HTML snippets and so on ready to be used by application authors. Last year Pradeepto worked with a team in India to create a beautiful booklet for FOSS.in. Unfortunately the sources were lost. The marketing team decided a new booklet had to be developed, consistent with the new branding and of high quality, and during the meeting we created a good structure and wrote most of the content. There unfortunately still is a lot to do - it's a big booklet and we really gained an appreciation for how much work had gone into the first edition. Most pressing are the lack of screenshots and artwork right now. Jos led the work on the booklet with assistance from Stuart, Justin, Daniel, Frederik, Lydia and Claudia at the sprint and many other members of the promotion team online. Any more help is welcome! The Dot editors in attendance (Troy, Kenny, Stuart, Lydia and Jos) discussed timing and procedures around the Dot. We went through a number of quick housekeeping topics, like what to do about HTML spam and how long we should wait after an important story is posted before we post another. There have been lots of articles lately, but sometimes timing has not been perfect. This is in part due to communication and infrastructure issues, and we think we found solutions for those. We also discussed some long-term plans for helping the KDE community keep track of important happenings in the KDE codebase. If you think you would like to contribute to the Dot in any way please contact us at dot-editors@kde.org. We are working on a prototype at the moment with new structure, content and design and Eugene was able to send us some great mock-ups as early as Sunday evening. We will present ideas to a broader audience as they are implemented, but the aim is to launch the new site in February to coincide with the 4.4 release. Later we will port the other subdomains to the new structure and layout. As you can see from the above list, we achieved quite a lot, but there is far more to do and for that we need more contributors. Marketing the KDE community does not serve the sole purpose of merely adding additional users for the various KDE Software. The strength of KDE is the community of contributors that helps to create and improve the software we produce, as well as the various pieces of infrastructure that surround the KDE community. Of course, we didn't work all the time. Meeting up in this way not only has benefits for more effective discussion but also in getting to know your fellow contributors. You feel more a part of the community and stronger obligations to follow up on promises if you think you might have to look someone in the eye. You also get to understand each other's personalities so that you can better interpret written communication without the accompanying body language and have a better idea of how to effectively communicate with different people. 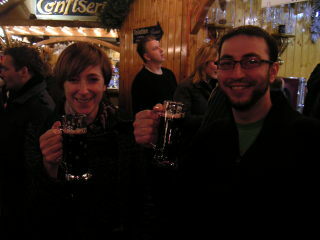 To this end, we explored a few bars and restaurants in Stuttgart and managed a quick glass of early gluhwein in Stuttgart's Schlossplatz. Next steps - can you help? The meeting was incredibly useful, and more importantly, energizing. We hoped to get a lot of work done - which we did, but brainstorming with so many creative people leads inevitably to an even larger number of ambitious plans... We are currently working on consolidating all the ideas into a roadmap for the future, to make coordination and cooperation easier. We are using the KDE community wiki now, which is where we'll be putting the plan up. This of course means it's easy to not only have a look at what the promo team is up to, but also pick up one or two of those tasks and join us in our effort! Our hosts for the sprint were KONSEC, a company that provides a compatibility layer to allow organisations dependent on Microsoft Outlook to transparently switch their groupware server to Kolab (which of course works seemlessly with Kontact and allows an organization to migrate many of their computers to Kontact and other KDE software). KONSEC kindly provided us with two meeting rooms, internet access and a supply of caffeine to keep us all alert and working. Martin (member of KONSEC and also of course a KDE legend) gave us an interesting presentation on KONSEC. After the terrorist attacks of 2001, countries became more aware of security and some, such as Germany, wanted to be less dependent on closed source software from other countries. This led to significant investment in both Kolab and KDE Kontact. With the German government as a user the system was from the start designed to be highly scalable - able to cope with hundreds of thousands of users. However, many companies and government offices used specific Microsoft Outlook and Exchange features and were not able to migrate all their systems right away. There are two approaches to interoperability in such a situation - make Kontact talk to Exchange or make Outlook talk to a free software server such as Kolab. The preferable option is to promote the free software server, so the KONSEC Konnektor allows Outlook clients to connect to Kolab. Once the Kolab server is set up, the organization is free to start using Kontact as a drop-in replacement for Outlook where possible. However, even where organisations do not take advantage of the Kontact features there are the cost savings and increased efficiency associated with using Kolab rather than Exchange. It also makes it easy for an employee who uses KDE software on a personal machine to use Kontact to access the company personal information server. KONSEC is mostly sales funded and the Konnector is proprietary software as some components are licensed from third parties. The Konnector is only necessary if you want to use Outlook so is only used on proprietary operating systems to interact with proprietary software. Martin gains most of his income working for ERFRAKON, a fully open source consulting company. We'd like to offer our thanks not only to Martin and KONSEC for hosting us, but also to our other event sponsors. Opensource Region Stuttgart provided drinks for us on Friday evening to welcome us to the city, an anonymous sponsor provided bottled water and other soft drinks to keep us going through the meetings and hive01 provided our lunch on Saturday. The KDE e.V. provided support with travel and accommodation costs that enabled us all to attend. Last, but by no means least, we must thank the local team: Eckhart, Frank and Frederik. They did a great job in organizing things and generally making us all feel very welcome in Stuttgart. Wow, you've all been really busy! I'm excited about the rebranding of the desktop environment - this sounds promising (finally no more stupid 'K' jokes). The new website sounds great, too. Sounds like a lot of quite difficult work - congrats on working it out! You already went huge steps towards improving KDEs Public Recognition, and it looks like that pace is continuing. Four years ago I dreamed to see KDE in newspapers, and that dream already came true this year! PS: I only saw one little typo: "commuity"
I thought we had all the typos... Fixed it now, thanks. And yes, the KDE promotion people have been doing some great work for a number of years and I'm very pleased to be part of that team now. But if it wasn't for the great products we'd have nothing worth marketing. For many people these type of events are very helpful. They are a chance to meet the people that have an impact on your work life and your company success. Familiarity brings a sense of comfort.